Be the first to share your favorite memory, photo or story of Marada. This memorial page is dedicated for family, friends and future generations to celebrate the life of their loved one. 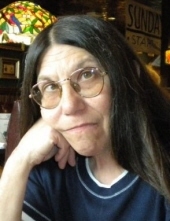 Marada R. Barbato, 67, of Kankakee, formerly of Momence, IL, died on Sunday, April 7, 2019, at the Riverside Medical Center in Kankakee, IL. She was born on January 9, 1952, in Chicago, IL, the daughter of Joseph and Mary Pegoraro Barbato. She is survived by three sons and daughters-in-law; Jason (Annie) Franc of Momence, IL, Josh (Lynette) Franc of Momence, IL, and Jeremy (Christina) Franc of Charlotte, NC. One daughter, Sarah Franc of Momence, IL. One sister; Maryann (Dave) Jorgensen of Alsip, IL. One brother; Joseph Barbato of Alsip, IL. Also surviving are twelve grandchildren; Anthony Franc, Christian Franc, Jeffery Franc, Dominic Franc, Jackson Franc, Kameron Franc, Hayden Franc, Payton Franc, Jeremy Franc, Jr., A’Maia Franc, Kiyah Franc and Johnathan Franc. She was looking forward to meeting her newest grandson; Kason James Franc. She is also survived by one great granddaughter Valerie. She was preceded in death by her parents, and one son; Jeff Franc. She was preceded in death by her life partner, Jeffery L. Franc on August 7, 1999. She worked as a manager at Shell Station in Momence, IL. She enjoyed reading, especially Stephen King novels, watching crime shows, and loved baking during the holidays, and most of all spending time with her children and grandchildren. To send flowers or a remembrance gift to the family of Marada R. Barbato, please visit our Tribute Store. "Email Address" would like to share the life celebration of Marada R. Barbato. Click on the "link" to go to share a favorite memory or leave a condolence message for the family.